Nineveh was a wicked, wicked city full of people who were known for their cruelty in war (Nahum 2:12-13), evil plots against God (Nahum 1:9), and exploitation of the weak (Nahum 2:12)…and Jonah hated them. Have you ever hated someone or a group of people so much you didn’t even want to tell them about God for fear they would repent and be forgiven for all their evil acts? Jonah did. His hatred for the Ninevehites was so fierce that he willingly disobeyed God. When God told Jonah to go to Nineveh, Jonah turned and went in the opposite direction. He willfully and deliberately disobeyed God. And I have too…many times. Instead of allowing God to be the judge, I’ve put myself in that position, handing out mercy and dishing out guilty sentences in my mind and heart without regard to what God might think. I falsely equate my will as His will and thereby state that my will is more important than His. So I go my own way…many times in the exact opposite direction God is calling me to travel, just like Jonah. And yet even in my defiance, God pursues me. Where can I go that God is not already there? Friends, one important lesson we can learn from our reading this week is this: we can never hide from God. Adam and Eve tried to do it in the Garden of Eden and Jonah tried to hide by getting on a boat heading to Tarshish. God knew exactly where each of them was hiding and what was hiding in their hearts as well. What is God calling you to do today that has you running in the opposite direction? Are you in a battle of whose will is stronger, yours or God’s? Has He pressed it upon your heart to reach out in love to a certain group of people and you find yourself unwilling to do so? Like Jonah, you can not flee from God. If you travel to the highest mountains, He is there. 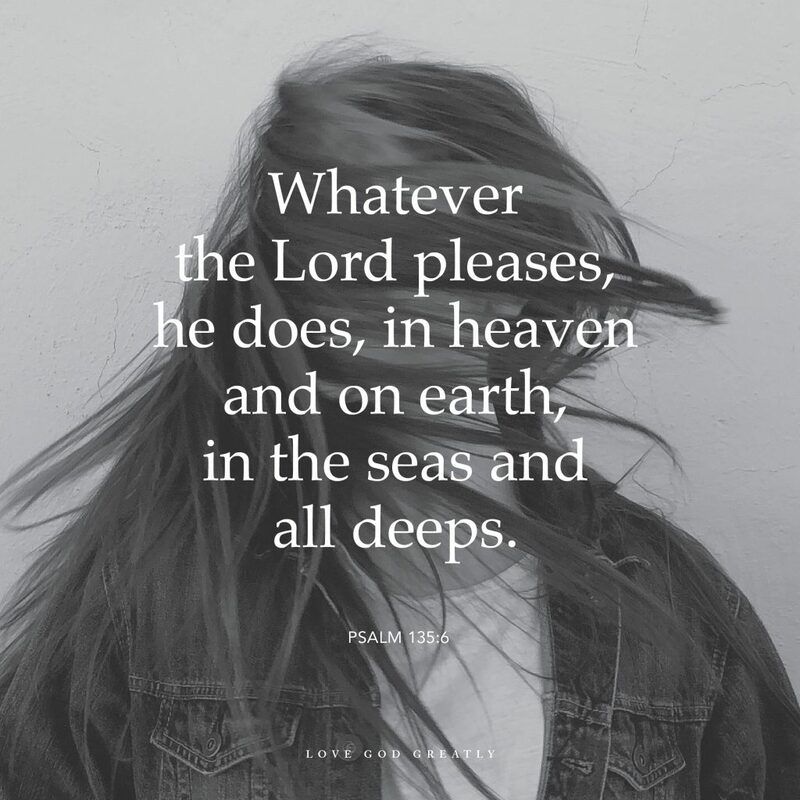 If you scuba dive to the deepest parts of our oceans, God is there as well. There is nowhere you can go that God is not already there with you. So let’s stop running, sailing, or heading in the opposite direction of His commands. Let’s stop choosing our wills over His because the truth of the matter is, His will always trumps ours. Let’s strive to be women who flee to God rather than away from Him. When God says “go” let’s go! Let’s not delay our obedience, ponder if people are truly worth helping or allow society’s prejudices to hinder us from reaching and helping the people God is calling us to. God has more for them and us on this amazing journey He has called us to! Let’s Talk: Introduce yourself today and let us know where you are joining us from!!! We’d love to meet you! Week 1 Challenge: Let’s start this study out in prayer. Ask God to reveal to you any defiance you are harboring in your heart to any calls of “go” He is giving you. Don’t let fear or sin keep you from obeying God’s call on your life! Hello Julie. welcome to our new study. I pray God blesses you and speak to your heart through the study. Blessings. Hey, Julie! I live in Verbena, Alabama. That’s just south of Clanton Alabama. I’m not from Alabama, but my Sister lives in Gerildine. Not sure how that relates to Claton or Verbena. It’s just a little ways from Fort Payne though. Hi I’m Cindy from WA state. Hi I’m Cindy from WA. Ik ben Bea uit Nederland. Fijn dat ik deze studie gewoon in mijn eigen moedertaal kan volgen! Gods zegen en nabijheid voor iedereen hier!! Hi, I’m Linda and I hail from NZ. I love the LGG group I’m in! Hello Linda. Welcome dear. Am glad to hear that you love the new group that you are in. We hank God for the gift of Godly fellowship. I do hope you have a blessed study. Amen. HEY I AM WANDA FROM “96” SC. hi dear Wanda! it is lovely to have you join us. I wish you the very best of the study. Much Love. God is calling me to trust Him deeply more than I have ever done. But the situations around me is so overwhelming when I think about them. And it is kinda hard to switch off your brain from looking around. But I have decided to just trust God, trust him when know what trust means and when I do not. Trust him when I feel like and when I do not. Just trust Him. Amen, Ebos! Just trust Him and His ways! You are an inspiration, Sister! I love your story! Praying for you as you continue your journey with Him! Thank you darling. God bless you. Hello Ebos! Thank you for your testimony and the work you have done for the Lord! My dad is originally from Nigeria, Naze in Imo State, and it’s so amazing to hear of the work you are doing for the ladies there. May the Lord richly bless your obedience! Oh! That’s absolutely awesome. It lovely meeting you dear. I am at peace when I trust in His plan, no matter my circumstances. Hello, from Ossian, Indiana. I am looking forward to this study. Welcome, Amy! So glad you are joining us for this study! Praying for you today, Sister! I really need this study in this time of my life. Hello Penni, You are in the right place! Praying for God’s blessings on your life as you go through the study! I’m originally from Venezuela but I’ve lived in USA for the past 31 years! TN is my forever home. Amen, Adriana! So glad you are joining us for this study! Praying for you, Sister! May God bless you! I’m Jill from Plymouth, Indiana. Looking forward to this study, and learning how to trust God more deeply. Hi Jill, so glad to have you join us! Praying for you as you go through this study! Blessings to you, Sister! So happy to be doing this study. Praying for you all!!! Thank you, Nichole! So glad you are here with us! Praying for you as you go through the study! Hi Tia! Welcome to the study! So glad you are joining us from Florida! Praying for you today, Sister! Hi, I am Linda from Southern California. I am ready for this study. Oh Linda we are so ready with you. Enjoy the study and may you increase in the knowledge of God. Hi! I’m Amber and I’m from Texas. Hello dear Amber! I love your name. Welcome to this study. We are delighted to have you here. Hello Jennifer! we are glad you are looking forward to digging into God’s word. That’s the greatest thing to look forward too. May God speak to you through His word, may you find Him in His word and may your life be changed by the knowledge of Him you find. Much love. Thankful this study is being offered. We are blessed to have you following it. God bless you Tammy. Hi ladies! 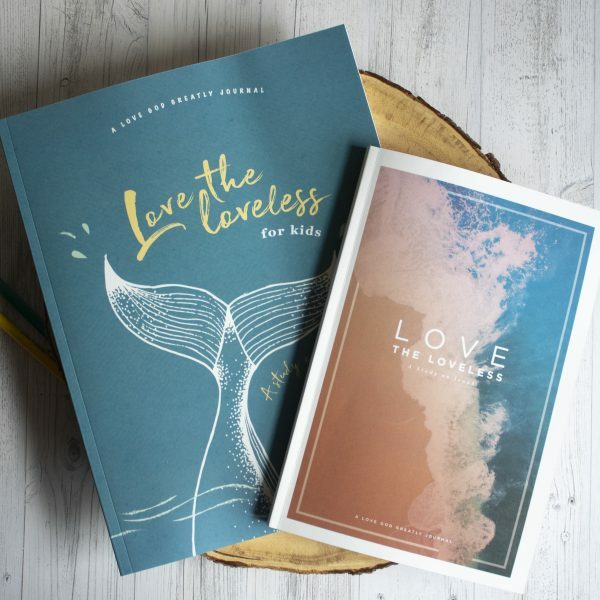 I’m Misty…this is my first Love God Greatly study, doing it from MO…super excited to see our lives changed by Jesus during this study…praying for all of you! Hi Misty! Welcome on board. Am so excited you are here with us studying at this time. God bless you and enjoy His word and may it change your life. Hi everyone! I’m Ezinne from San Antonio, TX. Joining with a group in the New Braunfels/Spring Branch area. Super excited to see what the Lord will reveal in and through this self reflecting story of Jonah. Praying we all come to submit to God’s will and sovereignty as we walk with Him and learn more and more that He is worthy of our trust and praise! Helo Ezinne! Your name means good mother in Nigeria. It is so lovely to meet you here. Please enjoy the study and may your life always be good as your name says. Much love. Hi I’m Shelley from Luxemburg, Wisconsin and looking forward to this study. Hello Shelley! welcome to this study. God bless you s you spend time in His word. Hi, I am Linda from Iowa. Looking forward to sharing this Jonah study with all of you. Hello Linda! Looking forward to studying with you too. Hope you do have a great time in God’s word. Amen. Hello Lori! That’s amazing! enjoy the study. Hi! I’m PATTI and I live in Evansville, IN. Hello Patti! It is great to have you here with us. Enjoy the study. Good Morning everyone! My name is Shannon. I am from Lafayette, Louisiana. I am so excited about the Jonah study. I haven’t read this book before & I’m looking forward to see what God will teach me.. It is so great to have you here. The book of Jonah is an interesting book and I know God would meet you in it. Enjoy the study dear. Hello, Carol, from Arizona & looking forward to another LGG Bible Study. Hello Carol! Looking forward to it too. Have an awesome time in His presence. Hi! I’m Sherry from PA. Excited for the new study. I miss the videos that you used to share each week. Hello Sherry! Welcome to another study. There will be an announcement on when the blog videos would resume. We do hope tau enjoy the study. Blessings. Hi, I’m Janice from Alberta, Canada 😊🇨🇦 and this is my first study with Love God Greatly 😊 I pray we all grow closer to our Father as we study His Word and encourage each other. Welcome Janice to Love God Greatly. We are delighted to have you here with us. Gods blessings. Hello Lori and welcome to our study. May your life be changed by God’s word in Jesus name. Amen. Good morning from Kentucky! This is going to be a great study. Have a most wonderful day everyone!! Good morning dear. Yes it is going to be a great study. God bless you and enjoy the rest of your day. God bless you. Hi I’m Carla from North Carolina. Thank God for this bible study,each other,and the time to draw closer to him !! Hello Carla and welcome. It is so great that you are here with us. God bless you. Paula from Long Island, NY – I’m super excited to be reading my group’s posts today – I know God is going to be doing something super-special in each of us! Praise God! Hello Paula! That is super awesome. Your excitement is contagious! I wish you the very best of the study. Love you greatly. I’m Hadley from Austin, TX! Hi Hadley! Welcome ti our Jonah study. I pray you enjoy God and His word. Much Love. Hi! I’m Amy from Georgia, and I’m so excited to be doing this study with ya’ll!! Welcome, Amy! I’m in Atlanta and glad you are joining us. It is not dear Vonda! You are in the right place. God is moving in us and through us to bring all He has said concerning our lives to pass. I speak to you dark place now to receive the light of God. May He make very crooked path straight for you by the power of His name. Amen. Much love. Hi, I am Janine from Northern California. Looking forward to learning more about Jonah and how to apply it to my life. Thank you. Dear Janine! Ma the Holy Spirit upon the words and give life to you in Jesus name. Amen. I’m Patti from Florida and I am happy to be joining another great study! Thank you to all who work so hard to put the studies together! Good afternoon! I am Em from Richmond, Virginia. 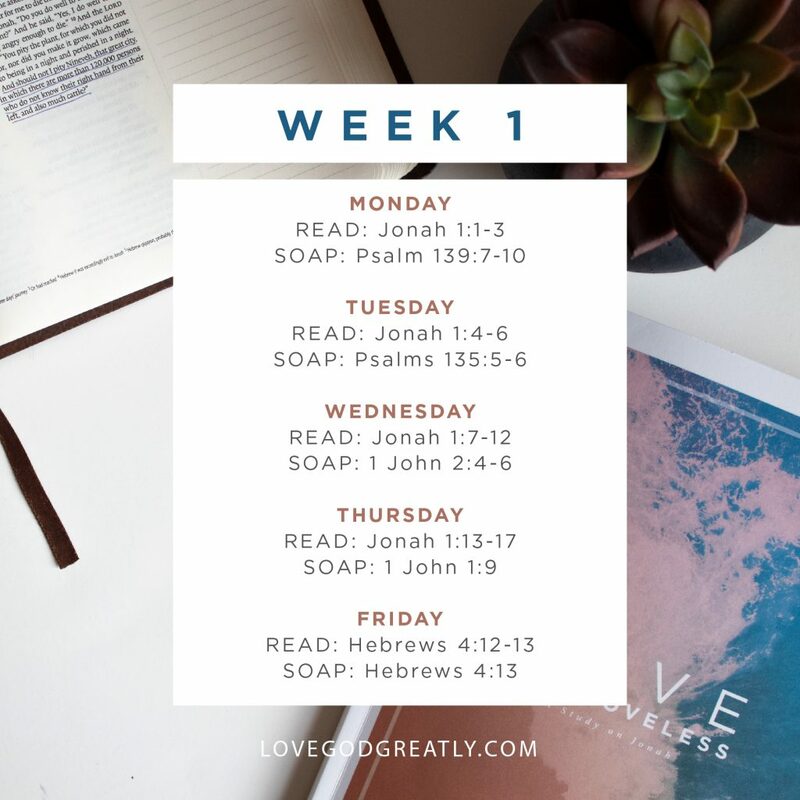 Jonah is my first Love God Greatly study! I’m looking so forward to these next 4 weeks of study and all the Lord has to teach us! Hello Em. We are glad you are joining us. We do hope you enjoy all God has for you this season. Much love. Hello Sharon. We are sorry about that. It was delayed because of the labour day. It would be up tomorrow God willing. You could equally use our app. It contains the studies and blog post and lots more. You can get it on Google play store or apple store. God bless you dear. Hello Melissa! I am too! God is set to to do amazing things through this study to the glory of His name. Enjoy the study dear. I can definitely relate to that level of hate that Jonah felt. I have an uncle who behaved so badly when my Daddy died, that even today if I think of him, I immediately get angry and think how unfair it is that he can go to Heaven when he KNOWS what the Bible says about God and love and still acted the way he did. I forget that, while the situations may be different, I’ve behaved badly as well and still received God’s grace. It’s hard to let go of hate that strong, but God knows what it can and will do to our hearts and that’s why He pursues us in that area and makes us address it. He loves us to much to let us continue to feed it until our hearts harden. I’m Beth and I’m from Verbena, Alabama. Yes dear Beth! He loves us too much to allow us destroy our lives with such hate. May God help us daily run to him instead of away from him in Jesus name. Welcome to this study darling. Hi everyone, my name is Jaana and I am in VA. I have been away way too long but excited and happy to be joining back in with LGG. Hello Jaana! Welcome back. It is a joy to have you back. I hope God blesses you daily as you spend time in His word. Much love . Hi, from Swansboro, NC. Very excited about where this study will take me! Hello Tammy! That is indeed a great joy. May God meet you daily in His word. Love you greatly. Hi I’m Day from Brazil!!! Hi Day! Welcome to this study. I love Brazil even thought I’ve never been there. Hope to visit as the Lord helps me. Enjoy the study darling. HI! I’m joining from Southern California. So excited to be here. I have been looking for a way to be involved in a bible study that works with my crazy schedule. Hello Rea. Welcome. This would work perfectly well. We have an app on Google store and apple store that you can use on your convenience. Just type Love God Greatly in the search and you get to download it free. We have our study on You version too. We have the journal for sale on amazon. All the money we get is used in the ministry to meet women in their languages. There is a Facebook 0age you could follow and also a Facebook group. I pray you enjoy the study. Much love dear. Hi everyone, I’m Theresa from Erie, CO. I just stumbled on LGG this week and happy to find a bible study that is so accessible and thoughtfully constructed. As a mom of 3 boys (5, 3 and 10 months) free time and childcare are sometimes hard to come by and this is something that I can commit to in those small moments I have to myself. I was just looking back on the Ruth study and have found refreshment and encouragement each day. Looking forward to diving into more of that with the Jonah study and in community here! Darling Theresa! We are delighted you choose to find time for God and His word even in your in the less time you have. God bless you and reward your efforts. We hope you enjoy God. Blessings and my love to the little ones. Haeremai, tena katoa, I am Pauline from Wanaka in the majestic Southern Alls of New Zealand. I have never before seen Jonah’s judgmental run away from the people of Nineveh in my own heart so clearly as I do today. God bless your teaching and grant you all fresh revelation by his Holy Spirit. Amine! Hello Pauline! we are grateful to God for opening your eyes to His word today. Glory to God. May it continue to open His word to you in Jesus name. Amen. Hello. I’m Alimah from Rowlett TX and I’m looking forward for my eyes and heart to be opened to God’s word. Hello Alimah! Welcome to this study. May God open your eyes daily to His word. As you have prayed may it be answered in Jesus name. Amen. Hello. I am Tara. I am just South of Nashville, TN. I am needing to get back in God’s word daily instead of periodically. Hoping to meet to friends that are local and see Jonah in a way that guides my heart. Hello Tara. It is a lovely thing to he in God’s word. I pray God leads you to Godly friends who together you can grow in Him. Blessings. Hello Jackie! How are you doing? Welcome to another study. God bless you. Amen. Hello Sisters in Christ, I’m Kimberly from Springfield, Ohio. Glad to be part of this great study. hello Kim. Great to have you joining us. We are glad too to have you. Enjoy the study. Good morning, I am Elaine from the West Indies. Do not have a group in my area but I love reading your devotions. God bless all. Hello Elaine. We are glad you are joining us for this study. We have a group on Facebook for you to be a part of dear. Here’s the link. We will all be so happy to have you. Good afternoon, I am Tricia from Amherst, VA.
Hey! I’m Jenn From New Jersey! Hi everyone! I’m Joy from Oregon! Looking forward to another study with my awesome fb group. LGG has been such a blessing! Hi my name is Maggie from South Texas (5 mins away from México to be exact) lol. Just want to pray for everyone and myself in hopes that we may get what God wants us to for his will through this amazing bible study, Amen. Hello. I’m Stephanie from Houston,TX Nice to meet everyone! I am from North Carolina.